Lately, Ford has been dumping tons of cash and engineering resources into their truck engines and transmissions and such. All of that is good, in and of itself, but it also makes tons of sense since the Ford F-150 is the bread and butter vehicle for the Dearborn-based outfit. 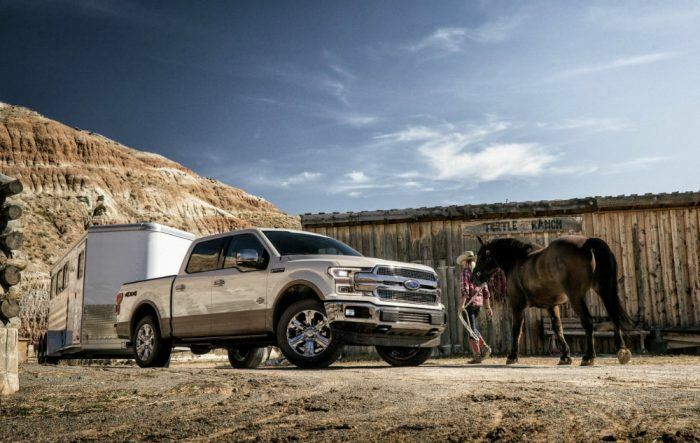 Ford – and General Motors and Ram – make a lot of big trucks. There is a lot of need for them across America, what with the contractors and farmers and other blue-collar types. Not to mention homeowners, since you can only haul certain types of stuff within the confines of a minivan. If you want to get really reductionist about it, you could say that big pickups are what American car companies do best. Ford’s new for 2018 F-150 will carry on what the company has been doing, pickup truck-wise, since the end of World War II. The 2018 F-150 aims to be tougher, smarter, and more capable than ever, according to Ford. And, if you listen to Ford, it all comes down to, or at the very least, starts with the running gear. The 2018 trucks will have the most advanced powertrain lineup yet and deliver best-in-class towing, payload, and efficiency. Mileage, you ask? An EPA-estimated 20 mpg city, 26 mpg highway, and 22 combined with the second-gen 2.7-liter EcoBoost. Towing and payload? Have no fear! The F-150 gets best-in-class towing by being able to drag around 13,200 lbs. with the 3.5-liter EcoBoost and haul 3,270 pounds of payload with the 5.0-liter V8. Ford says the upcoming F-150 will have “bold new styling,” but they always say that, and trucks always look like trucks anyway, don’t they? 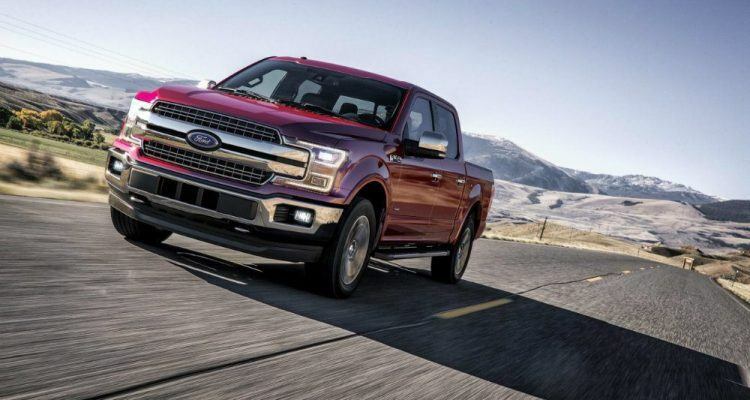 Also, Ford is committed to its use of aluminum, or as they put it “high-strength, military-grade, aluminum-alloy.” There will also be a slew of advanced safety technologies, a trick 10-speed automatic transmission and, of course, the F-150’s engine lineup. Speaking of, here’s the nitty-gritty on all the mills FoMoCo has on offer. First, there’s the second-gen 2.7-liter EcoBoost V6 mated to that SelectShift 10-speed automatic transmission. This drivetrain will get you the aforementioned best-in-class fuel economy with advanced dual port direct injection that delivers a 25 lb-ft. increase in torque. Next up is the normally aspirated 5.0-liter V8, also with advanced dual port and direct injection, giving you 10 more ponies and an additional 13 lb-ft. of torque. The mill also features spray-on bore liner technology, which it shares with the Shelby GT350 Mustang. The 5.0-liter V8 is paired with the 10-speed SelectShift automatic and also boasts the aforementioned best-in-class payload capacity of 3,270 pounds. If you want to tow something – say an enclosed trailer with a couple of sweet Alfa Romeos down to the track – the 3.5-liter EcoBoost V6 is the drivetrain for you. Its 13,200 lbs. of towing capacity is the equivalent of about eight Alfas, since those things have the density of bubble wrap. The 3.5-liter EcoBoost V6 cranks out 470 lb-ft. of torque (in case you’re worried about power) which allows it to top all diesel and gasoline-powered competitors, including V8s with nearly twice its displacement. 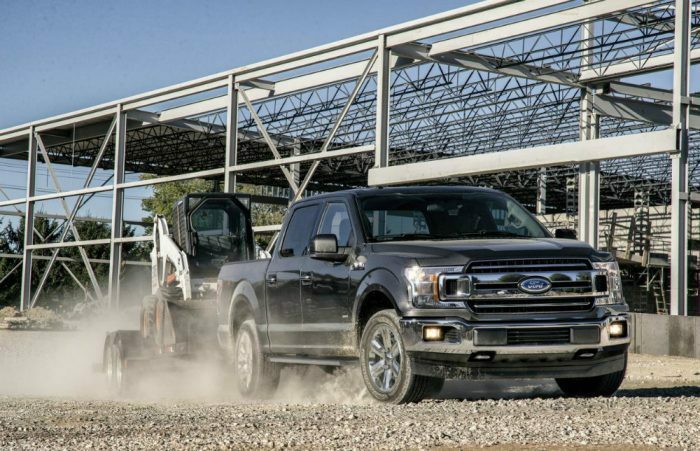 The 3.5-liter EcoBoost V6 puts out 375 horsepower and, in concert with the torque rating, make it the best F-150 engine for hauling heavy trailers. The all-new 3.3-liter V6 plant is more efficient too, putting out more torque when compared to the previously standard 3.5-liter V6. The now standard 3.3-liter nets you a 5 percent power-to-weight ratio improvement over the 2014 F-150, and also gets you better fuel economy and performance. Finally, there is an all-new 3.0-liter Power Stroke diesel V6 that was designed, engineered, and tested in-house. Unsurprisingly, it’s paired with the 10-speed SelectShift automatic and will be the first diesel engine for the F-150. Even if this is a truck, it is 2018, so there’s a gang of tech goodies along for the ride. There’s adaptive cruise control with stop-and-go functionality, for one. The system uses radar and camera tech to watch traffic and maintain a set distance between vehicles. Pre-Collision Assist with Pedestrian Detection is offered to help you avoid, or at least alleviate collisions with other vehicles and pedestrians – because you weren’t paying attention, were you? An embedded 4G LTE modem with a Wi-Fi hotspot connects up to 10 mobile devices at one time. There’s a new B&O PLAY audio system for when you’re listening to your songs. I will not comment on your selection of music, but if you call anything written after, oh, the 1980 as “Country and Western Music,” you and I are going to have a scrap on our hands. The available Pro Trailer Backup Assist gizmo allows you to steer a trailer “instinctively” via a center console-mounted dial. A Blind Spot Information System with trailer coverage technology is also available. BLIS, as Ford calls it, uses radar sensors in the taillamps to monitor areas that may not be visible around the truck and trailer, again to avoid the pain and humiliation of backing your boat, say, into piling or over your neighbor’s flower bed. The 2018 Ford F-150 goes on sale this fall. Production is supported by the Dearborn Truck Plant in Michigan and the Kansas City Assembly Plant in Claycomo, Missouri. No Comments on "Ford Says 2018 F-150 Has Segment-Leading Attributes, Advanced Powertrains"